i feel fortunate to have been born into a family that loved to travel. whether flying somewhere far flung and exotic or jumping in the car for a road trip up the coast, the travel bug bit me and bit me hard. a couple of years ago we had the opportunity to stay in rome for a stopover before heading further north to visit my husband's family in northern italy. and though it was barely enough time to dip our toes into the culture, it was enough to hook me. being big on research before i travel always seems to be worth the time, especially when travel time is short. and though i would have loved to have stayed for a decent amount of time this readers' digest version was better than none at all. here are my picks for the eternal city. pretty much smack in the middle of two of rome's most famous piazzas, the spanish steps and piazza del popolo, as well as being on one of the tines of the roman "tridente" lies the hotel babuino 181. location, location, location. honestly, you can't beat it! with so much within walking distance seeing all the major sites is a breeze and if you aren't down for the touristy bits and pieces this locale is perfect for strolling, shopping, eating, drinking, browsing art galleries and basically learning how to live la dolce vita! the rooms are lovely and clean while the staff is helpful but unobtrusive. one of the best parts of staying in one of the boutique hotels that babuino 181 is part of is the owner, alberto moncada di paterno, of the "rome luxury suites" group. taking the time to write with absolute passion about his very favorite places in rome this hotelier produced a guidebook beyond compare to give guests and insider's view of his "roma". happy to have researched well enough to have found this hotel, the rest of my research pretty much got thrown out the window. the only skinny on rome i needed was tucked in my purse in the form of signore alberto's "a roman notebook". there's so much to see and do in rome putting a schedule together can be daunting. being short on time we opted to take a private tour which took us through the coliseum and the vatican among other must sees. these tour companies have some sort of "fast pass" access unavailable to the general public. as well, some tours offer admittance to areas that are otherwise restricted. (do your homework before settling on one of the many companies that run these behind the scenes tours before booking.) not usually a fan of organized tour outings i was quickly turned around by our guide who sated us with her wealth of knowledge. suffice to say we ended our day rapt from stories and myths we would never had known had we decided to go it alone. but that was one day and that was perfectly enough. the rest we sorted on our own. 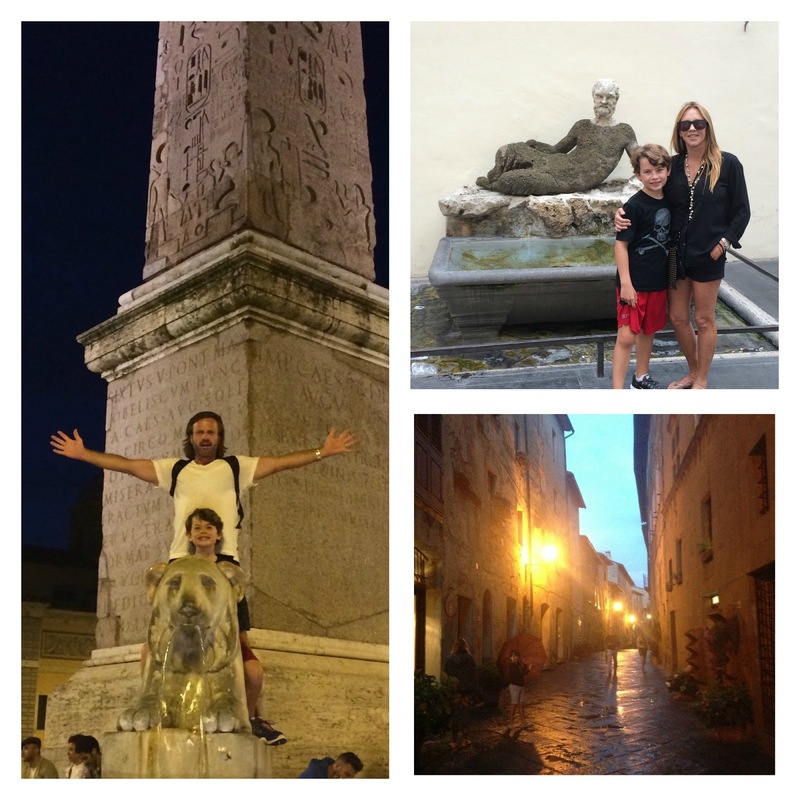 the following day we set out on our own walking tour to take in the breathtaking pantheon, stroll piazza navona and see as many cathedrals, squares and fountains an 8-year-old could muster. unfortunately, the trevi fountain i insist on throwing coins into on each and every roman holiday was closed for renovations. this is my good reason to go back! villa borghese gardens: this is one of those places you have to experience given the chance, and there are so many options from which to do so. walking is almost always my first choice but you can rent bikes or segways, even modified golf carts. we opted on a golf cart as the heavens opened up just as we got into the parking lot and it was pouring!! exploring as much as we could we stayed warm and dry as our mode of transport was zipped up tight to keep us from the elements. needless to say, we had the place practically to ourselves. it was perfect! piazza del popolo and the spanish steps: as they say, when in rome... so sit for a bit, relax and take in everything around you. i don't know about the rest of you but i don't think i ever do that! but i did there and i think it's what made me fall in love with rome all over again. watching young lovers kiss and whisper passionately to each other. elderly people playing cards or holding court while they tell the same story they've probably recited a thousand times to the same friends. giggling children running rampant under parents' watchful eyes. i know it's got to be the same in rome as everywhere else. rushed, urgent, stressful. but it sure doesn't feel like it. it feels like they have figured out how to enjoy the moment and i fell right in line while i was there. one night during dinner we spied a large crowd gathering at the piazza. wanting to see what the commotion was, we walked over to find "michael jackson" getting ready to put on the performance of a lifetime on a perfectly warm moon filled night. dancing and singing along to faux m.j. in the piazza del popolo? surreal is the only word that comes close. i guess incredible works as well. the crypt of the capuchins: located beneath the church of santa maria della concezione dei cappuccini and an easy walk from the spanish steps you'll find the crypts of the capuchin friars. the bones and skulls, as well as a few mummified bodies of over 3,700 capuchin friars and indigent romans adorn these rooms. from chandeliers, crosses, and crowns to coats of arms, everything is made from the bones of the dear departed. and though this is probably not for everyone, i found it fascinating and achingly beautiful. while i've heard others find it a bit more macabre, and you do feel a "weight" come over once inside, i like to think of the crypt of capuchins as art of high caliber made with love and the utmost respect to those that line these walls. the immense amount of time, care and painstaking detail given to create these 5 chambers was mind blowing. gladiator school: not having the luxury of time, we never made it to this one but i've heard nothing but good about this place. if you are traveling with children and can carve out a day this is the stuff kids' dreams are made of. throw a stone. 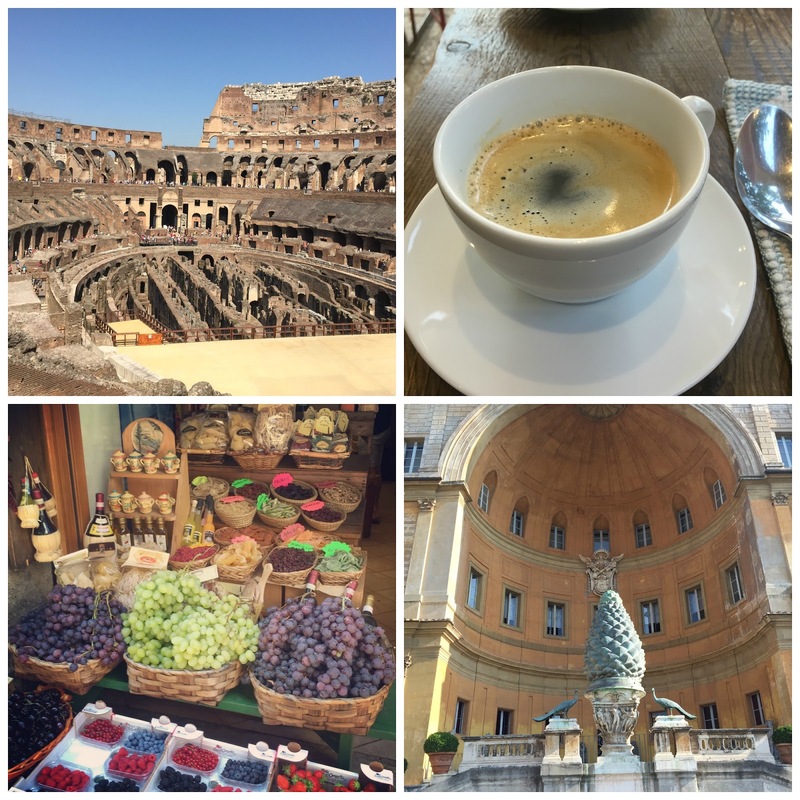 i don't remember ever having a bad meal in rome but below are some of the more memorable. dal bolognese: one of the oldest and most famous restaurants in rome located at the piazza del popolo. yum and the location makes the food taste even better for those of you who are "people watchers" like i am. i go for the pasta here. la sagrestia pizzeria: this is the real deal for authentic roman pizza. yes, please! osteria margutta: sit on the terrace if the sun's out. beautiful place on an adorable street. desserts are all homemade at this classic roman spot! i didn't buy but you must!!! the three streets making up the trident will find you anything you can think of. don't forget to have at least one gelato a day. you'll walk it off. they are around every corner and so good i found it really hard to pick just one!! !